The stresses of college life have made us all wish we could turn back the clock and revert to our childhoods at one point or another. But one Rice University student has made this dream a reality, not with a time machine, but with 13,000 colorful plastic balls. 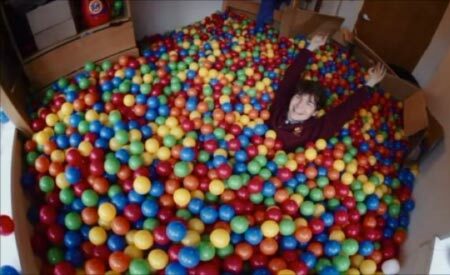 David Nichol, a computer science major at the private research university in Houston, Texas, recently turned his single-student dorm room into a PlayPlace-style ball pit. Nichol lofted his bed and moved his desk and dresser into a common space to make way for the balls, which measure two feet deep across the whole room. After getting the okay from security, Nichol transformed his room into a rainbow sea of plastic spheres, much to the delight of other Rice University students. His room now attracts so many visitors that Nichol had to establish some grounds rules for playtime, including no shoes, no food or drink, and no funny business. Nichol was inspired to turn his dorm room into his own personal Chuck E. Cheese’s after reading a comic by Randall Munroe, which states that “grown-up” is a relative term. Even though we’re just a little jealous, props, David, for making every kid at heart’s dream come true!